Last Year: 10th with a 11-13 (-45) record and 26 points. 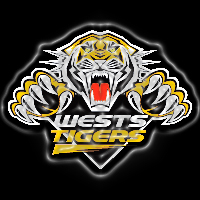 The Mick Potter era begins after Tim Sheens was punted for not getting the Tigers to a Grand Final during their recent premiership window... thing is, despite having Benji Marshall and Robbie Farah still on the books - Potter might be taking over a year after that window closed. Braith Anasta is the 'name' acquisition but he's not expected to be the game changer the Roosters thought he'd be when they signed him from the Dogs many moons ago... Backrow signings like Eddy Pettybourne and Bodene Thompson have potential but might not even start the year in first grade... if the Tigers are looking for impact it might come from the emerging players on their roster rather than the imports. Rory BRIEN, Jack BUCHANAN, Michael BULLOCK, Josh DAVIS, Jarrod FARLOW, Asipeli FINE, James GAVET, Matt GROAT, Jy HITCHCOX, Masada IOSEFA, Sean MEANEY, Jacob MILLER, Joel REDDY, Ava SEUMANUFAGAI, Seffa SILAFAU, Tim SIMONA, Shaun SPENCE, Sauaso SUE, Bodene THOMPSON, Lote TUQIRI. Luke BROOKS, Manaia CHERRINGTON, Kyle LOVETT, Matt MULCAHY, David NOFOALUMA. Tuqiri is done for 3 months so the wingers will be Koroibete and Utai. Moltzen looks to have a few rounds at fullback before Tedesco gets his chance, while Miller is the new #7 next to Marshall in the #6. The forward pack will miss Woods straight up, but its final makeup could be anything - youngster Buchanan might get the call after being leant on during the trials with Woods out. WTG: Moltzen, Koroibete, Ayshford, Lawrence, Utai, Marshall, Miller, Buchanan, Anasta, Fulton, Blair. Bench: Pettybourne, Bell, Iosefa, Thompson. James Tedesco was the name on everyone's lips before 2012... then he did his knee in Round 1. If fit - keep track of his first grade status. Then there's Marika Koroibete (who reminds many of Noa Nadruku with more speed) who is a lock to start in Round 1 and Jacob Miller who needs a big opening month to keep Curtis Sironen out of the squad. The kid who has gone under everyone's radar however is prop Jack Buchanan who gets his shot with Aaron Woods hurt. One thing we might all see with Potter in charge is young players getting a chance earlier than they might have under the former coach. The SCG is a great place to watch football... once. It's not the ideal viewing platform for league but when the Tigers host the Dragons in Round 6 there on Sunday April 14 at 3:00pm - make a special effort and get there. The other game to mark down for very late in the year is at the SFS in Round 25 when the Bunnies visit. The premiership window is closed... this year at least. But that doesn't meant the Tigers can't make the playoffs. Any team with Farah and Marshall is a threat on their day, but the support staff has to be significantly better to make the Tigers any kind of regular threat. Unlike Sheens, a playoff spot alone will be enough for Potter to get a big tick in his first year in charge. 11th | Not the team they were, but sometimes a couple of new ingredients are what a team needs to surprise everyone with the end result. So surprise us Tigers. 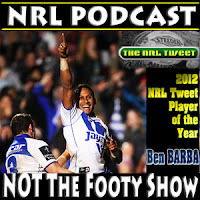 Can Robbie Farah or Benji Marshall (2011 winner) claim Ben Barba's mantle as the game's best player in the 2013 @NRLTweet Player of the Year Awards?